Tales of celebrity event management and secrets of the trade were all on offer from Liz Taylor – Founder and MD of TLC Events Management Company – at The Fed’s fourth annual Ladies Lunch. Close to 70 women packed into the Purple Room at Heathlands on 13th November for an entertaining afternoon, hearing from one of Manchester’s premier events management professionals, with a delicious lunch catered by The Fed’s in-house team. 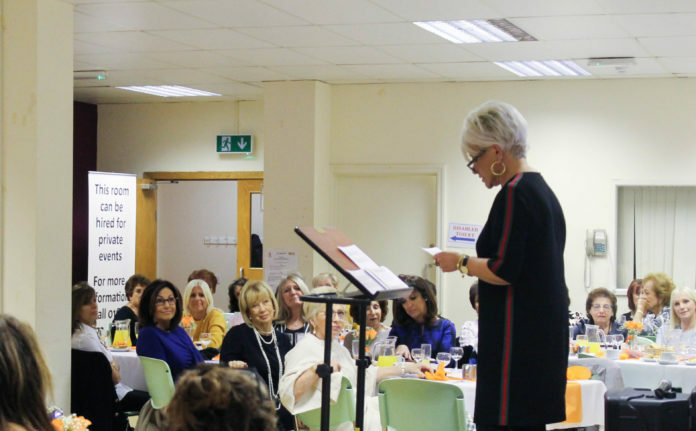 Opener Sharon Ferster paid tribute to the outstanding work carried out at Heathlands Village and across the Manchester Jewish community, before handing over to the star. Guests heard an eye-opening talk from Liz Taylor, naming some of her famous contacts, her most memorable experiences, and some trade secrets picked up over three decades in the industry. Next articleWho says nobody keeps Kosher in Essex?